With drunken driving responsible for 10,322 deaths in 2012, we’d never encourage the act of drinking and getting behind the wheel. But if you must drink in your car, then you should venture over to one of the 11 states where you won’t be subject to so-called “open container laws” banning open alcoholic beverages in vehicles. Of course, if you’re over the legal limit you’ll still get a citation for driving under the influence (just as you would in any other part of the country), but a new report published by the Advocates for Highway and Auto Safety finds that just 39 states and Washington, D.C., have open container laws. Alaska, Arkansas, Connecticut, Delaware, Louisiana, Mississippi, Missouri, Tennessee, Virginia, West Virginia or Wyoming don’t have open container laws that meet federal requirements. Only in Mississippi is it legal to drive while drinking an alcoholic beverage, according to the aptly named site OpenContainerLaws.com. 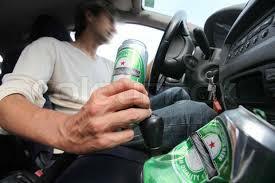 But the 10 other states without open container laws won’t stop you from driving with an open bottle of alcohol in your car’s cupholder, so long as you don’t consume the potent potable while operating the vehicle (though laws may vary from town to town).